The moment I set eyes on this recipe all i have wanted to do is eat it. I loved cinnamon buns over in Canada and could not wait to recreate that sweet hug like feeling you get when you eat them. I love the idea of cardamon in the dough and mixed with that popping sweetness of blueberries and the orange is sure to be a winner. Very simple to make, but quite messy, so if your not prepared to get your hands (and yourself) a little dirty this is not the recipe for you. I quite enjoyed the process and the taste, but overall it was a little doughy so next time will have to change a few things. These would be great to pop in the oven before a picnic or group event and serve them as quick as possible! Stir the yeast into the warm milk in a bowl, then put it aside. If using cardamom pods, lightly bash them in a pestle and mortar, then pick out the husks and pound the seeds to a fine powder. Beat the eggs and salt in a large bowl, then add the cardamom, sugar, melted butter, 500g of the flour and the milk and yeast mixture. Whisk constantly as you add everything so you end up with quite a thick, gluey consistency. Mix in the remaining 300g of flour until you have a dough. 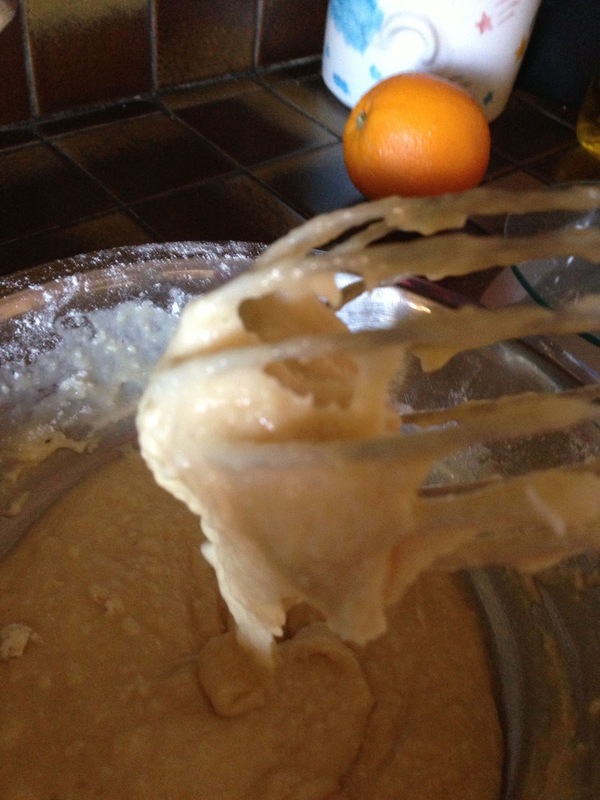 Use clean floured hands to bring the dough together, then dust the top with flour. Cover the bowl with clingfilm and leave in a warm place to prove for 1 hour, or until the dough has doubled in size and is full of air pockets. Meanwhile, put the blueberries and caster sugar into a bowl. Finely grate the orange zest and add most of it to the bowl, along with a good squeeze of orange juice, then mash together with a potato masher. Line a large baking tray with greaseproof paper, then dot the paper with a few knobs of the butter and sprinkle over half the icing sugar. Dust a clean surface and your hands with flour and gently stretch and pull the risen dough out until it's a bit bigger than an A4 piece of paper. This next bit is pretty messy, so have a bowl of flour on hand to help you handle the dough and don't be alarmed if it seems quite wet. Use a slotted spoon to move half the mashed blueberries on to the dough. Try not to include too much juice. 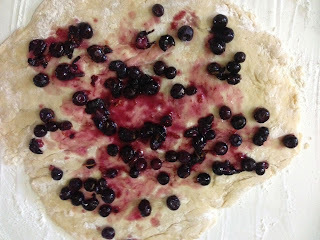 Use the back of the spoon to spread the blueberries around the dough. 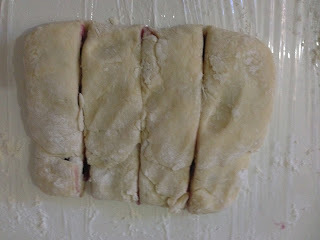 Pull the sides of the dough up and into the middle like an envelope, and keep turning and pushing the dough together. Cut the dough into 8 equal portions, then pull and stretch each one into a long, thin sausage shape, twisting them around on themselves so you get a sort of rough knot. Arrange them on the tray, leaving enough room between for them to spread as they cook. Push your fingers into the top of each one to make a little well, then spoon in a few of the remaining mashed berries and gently push them down. Spoon over a little of the blueberry juice from the bowl, then sprinkle with the rest of your demerara and the reserved orange zest. Cover with a damp tea towel and leave to prove for about 20 minutes in a warm place. Preheat your oven to 180ºC/350ºF/gas 4. Once the buns have risen, put them into the oven and cook for 25 minutes, until golden and crispy. Serve them, hot and delicious, by themselves or with warm custard. Changes Made: I had a feeling that these buns would be good, but heavy so decided to halve the recipe and only make 4. 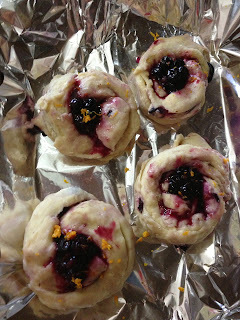 Results: These were really easy to make, and I love to get my hands dirty so really enjoyed the process. Overall mine turned out a little dense. Not sure if it was due to my yeast being a little out of date (or a lot, depending on how you look at it! ), or my technique as a L plated baker. 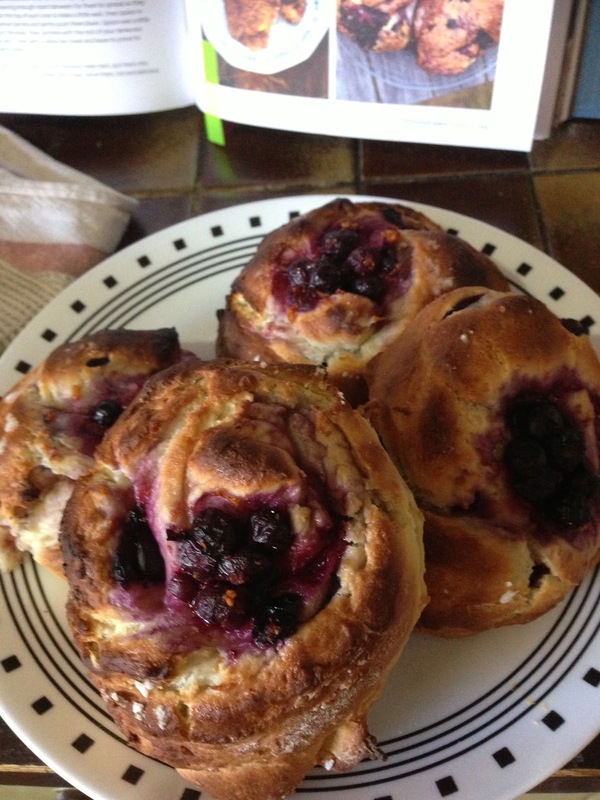 They were amazing fresh out of the oven, and are definitely designed to be eaten straight away. Next Time: Definitely make sure my dough has risen enough and the yeast is working property to get a lighter, fluffier bun.